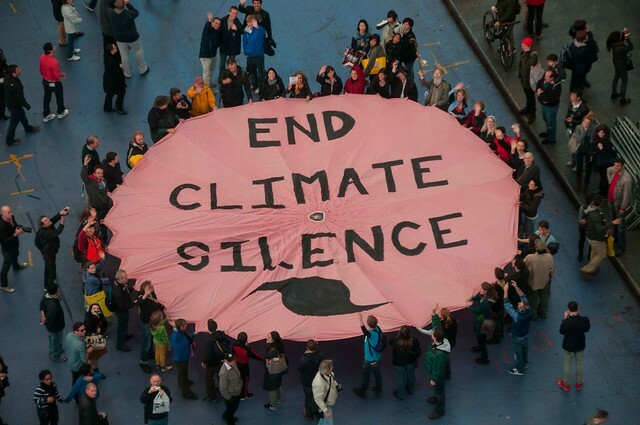 While Hurricane Sandy slowly approaches, climate change activists appeared in Times Square, holding the parachute above. It wasn’t a huge turnout, of course, but New York City is basically shut down, including Wall Street and the Subway system. Linking a particular weather event to a longer term process of climate change is more a rhetorical device of the religious right than of these activists (on-line minister John McTernan blames “the gay agenda” for the storm), but Hurricane Sandy presented an opening. The presidential election campaign crowds out both movement events and coverage of movement events. It also crowds out issues. Both major party candidates have spent the past few weeks trying to avoid sounding like the activist bases of their parties, seeking to reach some imagined middle of the political spectrum. 350.org, a climate change advocacy network, notes that this is the first set of presidential debates since 1988 when climate change was not treated as a serious issue. Both President Obama and Governor Romney see only risks in talking about climate change now: climate change skeptics could find evidence that President Obama might take action on the issue if he mentioned the phrase. And Governor Romney might remind swing voters somewhat sympathetic to science about the positions he’d taken during the Republican primary campaign. So, climate change–and the environment in general–is an uncontested issue in the national election. And that’s not all: you’ll recall that the presidential debate on foreign policy also omitted discussion of immigration, the drug war, and the prison at Guantanamo Bay (yes, the one candidate Obama had promised to close). The only mention of the US use of military drones for assassination came from Governor Romney, who announced his support for President Obama’s mostly unarticulated policy. Hurricane Sandy offered a bit of a break in the electoral action, and environmental activists have tried to seize the moment, hanging their analysis onto an important news peg and a tiny open window for discussion of climate change. This entry was posted in Uncategorized and tagged 350.org, Barack Obama, climate change, election, elections, foreign policy, Hurricane Sandy, killer drones, Mitt Romney, New York City, Times Square. Bookmark the permalink.